YOUR BIGGEST ASSET. YOUR MOST VALUABLE RESOURCE. YOUR SOIL. Understanding your soil will help you prepare for success and cost-effectively allow you to place fertility resources where they will do the most good. With the fluctuating costs of fertility products, now more than ever it's important to get the right product in the right place for the right reason. Our ultimate goal is to cost-effectively maximize the highest yield potential for each grid or zone. 1. Composite Sampling. It's a start. Each composite is sampled with 20 cores pulled in an M, U, or Z formation. While composite sampling can be site specific, results are not 100% inclusive to every soil characteristic within a field. Intensities range from 10 acres per bag to 1 field per bag. 2. Grid Sampling. A better option. 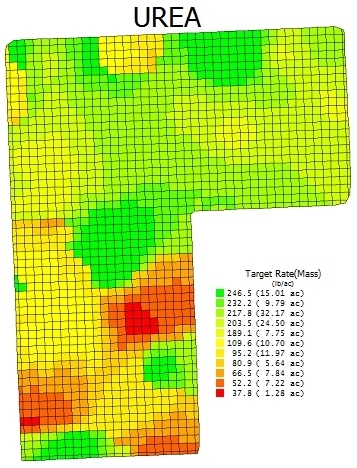 Grid sampling gives you a closer look at fertility variables within a field. Sample points are set according to the grid intensity ordered, 2.5 - 5 acre grids are optimum. Ten core samples are taken in a systematic pattern within the grid. This method is most effective for growers applying a large amount of solid or liquid manure. 3. EC Management Zones. The best option. 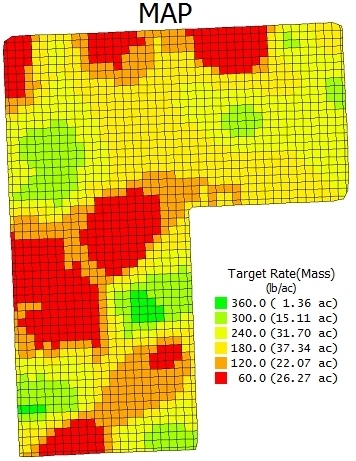 Management zones are the most accurate method of determining, correcting and managing variable soil characteristics. We use a combination of electro-conductivity and geo-referenced elevation data to create very specific management zones within your field. After completion of soil sampling, these zones identify and quantify soil characteristics so we can use the results to develop a 3 tier program.